All of us are scared of old age, aren't we? We're scared of the possibility of illness, we're scared of the repeated hospitalizations, we're scared of the loneliness, we're scared of the slow inevitable decomposition of our bodies. 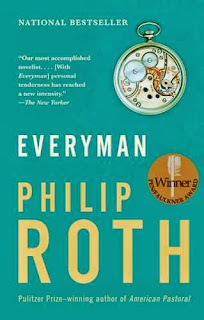 Philip Roth's Everyman is about this fear. Poor Everyman. We meet him at his funeral. Around his grave are gathered his colleagues from his advertising career, his hale and hearty elder brother, his two sons who hate him, his daughter who loves him, an ex-wife, a former lover, fellow residents from his retirement village. Having started with his death, the book jumps straight back sixty years to his childhood, to his first hospitalization, a hernia operation that was scary because he was so young and because the boy on the next bed died. Many years pass before the next hospital visit - this time a routine appendicitis. And then, a few years later, comes the inevitable heart trouble. His life almost seems like a telescope aimed at death - each succeeding lens represents each of his major illnesses, coming ever closer and closer together, until he is in hospital at least once a year, until the final surgery that kills him. As Everyman grows older, sickness and death seem to surround him. Constant back pain drives a lady in his retirement village to commit suicide. His friends seem to be affected by different horrible diseases - cancer, heart trouble, depression. Even the incredible good health of his elder brother seems to make fun of his own sickness. Throughout, there's the harsh contrast with his own previous life. Everyman is a swimmer, he swims an hour every day - in the sea! His sexual appetite led him to cheat on his wives and cost him two marriages. In fact, it's while he's on a secret weekend with his mistress in Paris that his mother dies. Everyman's active life is maybe a warning to the reader - don't feel superior, don't feel that this can never happen to you. If this can happen to somebody who's a regular swimmer, who has no history of illness in the family, it can very well happen to you. In some sense, Everyman's sickness seems foretold. During the childhood he spent in his father's watch-and- jewellery store, he was obsessed with the old watches that people used to exchange for new ones. He spent hours with them, playing with them, trying to fix the broken ones. And he always used one of the old watches, one of the rundown watches, rather than a new watch. But still, Everyman somehow never makes his peace with death. He visits the run-down Jewish cemetery where his parents and grandparents are buried. He spends time with them, seems to feel that they are with him. He talks to a grave digger, finds out how graves are dug. All this seems to be in preparation for death. And yet, as he goes into his final surgery, he's optimistic. He feels like he'll survive. He WANTS to survive. He doesn't know enough about the nothingness that comes after death to want to go into it.